Home / Guides / Tokyo – modern and traditional – city of incredible contrasts! We pass through the vibrant and modern shopping districts such as Ginza, Harajuku, Shibuya, Shinjuku, or completely different, smoky and tiny alleys of Yokocho. We will look at Tokyo from the height of the tallest skyscrapers in Nishi-Shinjuku, including Tokyo Skytree and Tokyo Tower, and admire the old magnificent temples and shrines like the most popular Meiji shrine. And we will certainly relax and meditate in the traditional Japanese gardens such as the author’s favorite Rikugien near the metro station Komagome. If you wish to download more guides, activate your Premium subscription and get all guides for the price of one. Brian Wood-Koiwa is an American urban/Japan fine-art photographer based in Tokyo, Japan. He has lived/worked and travelled around the world in places such as Qatar, Ecuador, Thailand, Australia, and as a Peace Corps Volunteer in central Africa, before settling down in and around Tokyo. 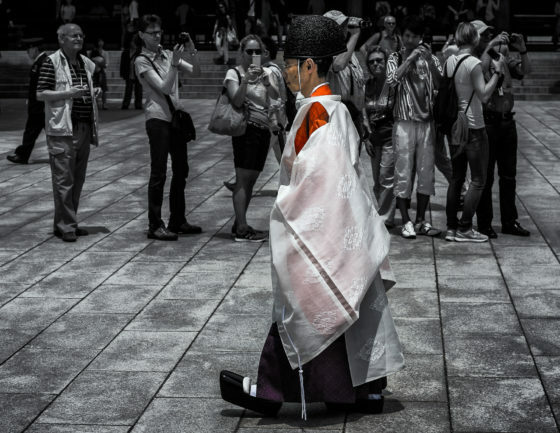 He has been living in Tokyo for over 14 years, so his photography is inspired by the contrast of the ultra-modern and traditional aspects for which this megalopolis is known. He calls his photographic style “UrbanWeird”: celebrating The City by emphasizing the beauty and “un-beauty” of the seemingly urban mundane. His main focus is anything urban (urban landscape, cityscape, street, urban abstract) and the temples and shrines that dot the city, at times existing harmoniously and other times not so harmoniously – but interestingly – with the vertical steel and glass bones of the city. He does also enjoy photographing the sublime natural wonders that surround Tokyo that help contain the urban chaos. You can find his work and services at http://urbanweirdphotography.com. This entry was posted in Guides and tagged gardens, Ginza, mobile app, modern, photo app, Shibuya, Shinjuku, shrines, temples, Tokyo, traditional, travel app, Yanaka, Yokocho. Bookmark the permalink.